Time was that a bag of stale pretzels and who-knows-how-old pickled eggs were about the best we could expect to nosh on at our local watering hole. Not that there's anything wrong with those tried & true classics. But today, when we hit our favorite clubs, pubs and bars, we're accustomed to fare of a more elevated sort. Well, here are some foods from a handful of establishments that far exceed our traditional notions of pub fare and bar food. When is a corn dog not a corn dog? When it's the corn dog at Whiskey Street (323 S. Main, 801-433-1371, WhiskeyStreet.com). These aren't your daddy's batter-wrapped tubesteaks. At Whiskey Street, the hot dogs are made from braised pork belly, which is coated and fried in jalapeño-cornmeal batter and served with spicy-sweet mango mostarda. At the Irish-themed Piper Down Public House (1492 S. State, 801-468-1492, PiperDownPub.com), you'd naturally expect to find Emerald Isle staples like corned beef & cabbage, Irish stew, shepherd's pie, fish & chips, bangers & mash and the like. And indeed, they're to be found on the menu. But I'm happy to see that our neighbors from the Great White North are represented as well. The ultimate bar food might just be Piper Down's Canadian-style poutine french fries with fresh mozzarella and brown gravy. Whenever I'm bellied up to Bambara's bar in the Hotel Monaco called The Vault (202 S. Main, 801-363-5454, Bambara-SLC.com), I find it hard to resist the housemade potato chips smothered in blue cheese. 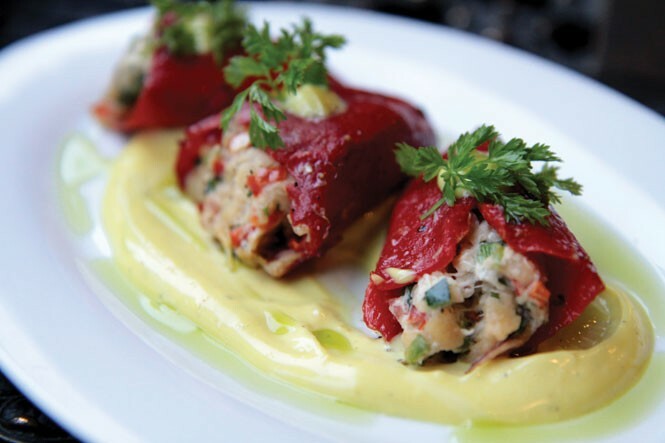 Even so, my go-to bar bite is Chef Nathan Powers' stupendously tasty red piquillo peppers stuffed with crab and served with scrumptious saffron sauce. This is truly bodacious bar food. Plenty of bars have burgers. But there's only one I know of in Utah that considers foie gras a garnish. That's the Lux Burger at Burgers and Bourbon in Deer Valley's Montage Resort (9100 Marsac Ave., Park City, 435-604-1300, MontageHotels.com/DeerValley). It begins with a classic beef-burger blend and is elevated to the stratosphere with the addition of foie gras and truffles, plus bourbon-caramelized onions and arugula. 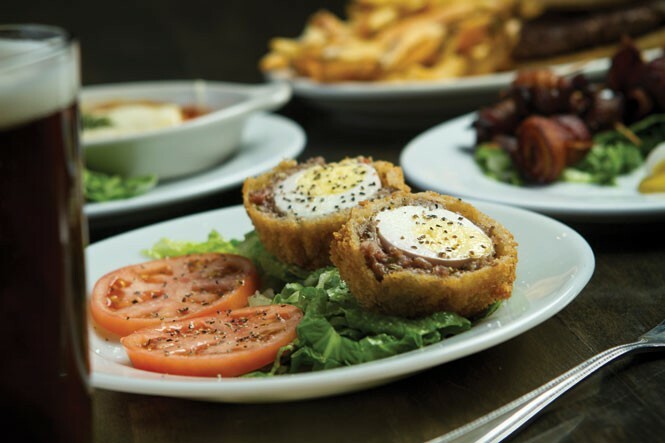 Although Poplar Street Pub's (242 S. 200 West, 801-532-2715, PoplarStreetPub.com) menu is loaded with excellent burgers, truffled hand-cut french fries, tasty tacos and more, I inevitably find myself leaning toward a true pub classic: the Scotch egg. 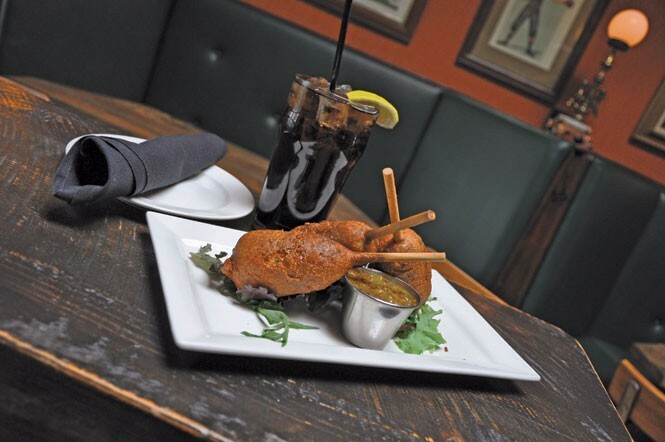 It's a hard-cooked egg wrapped in Poplar Street Pub's housemade fennel-spiked sausage, then beer battered and deep-fried. Is it part of my diet plan? Nope. But now and then, you just have to bow down to the power of the Scotch egg. Cheese and wine have a fondness for one another. And I have a fondness for the extensive wine selection at BTG Wine Bar (63 W. 100 South, 801-359-2814, BTGWineBar.com), especially when I've paired a glass with owner/chef Fred Moesinger's take on mac & cheese: al dente penne pasta with wild mushrooms, roasted garlic, herbs and three different cheeses, baked with fresh bread crumbs and drizzled with truffle oil. At The Annex (1048 E. 2100 South, 801-742-5490, TheAnnexbyEpicBrewing.com), I'm inclined to chant, "Raw! Raw! Raw!" That's because they dish up one of my favorite foods on the planet: beef tartare. You certainly don't want to mess around with inferior meats when serving beef tartare, and The Annex doesn't. Chef Craig Gerome begins by mincing raw Niman Ranch Beef, spikes it with mint, and serves it with a raw egg yolk on top and crispy housemade lavash alongside. 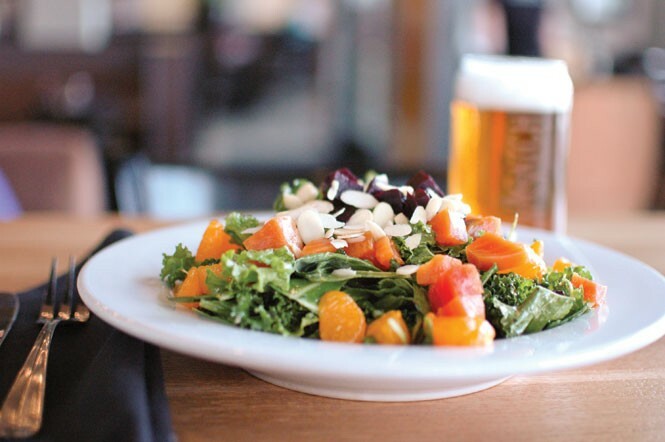 Meanwhile, just around the corner from The Annex, The Wasatch Brewpub (2110 S. Highland Drive, 801-783-1127, WasatchBeers.com) offers pub fare that even vegans can love. To wit, the Super Food Beet Salad: a colorful mélange of raw kale, arugula and collard greens with roasted beets, mandarin orange slices and shaved almonds, drizzled with yuzu Champagne vinaigrette. 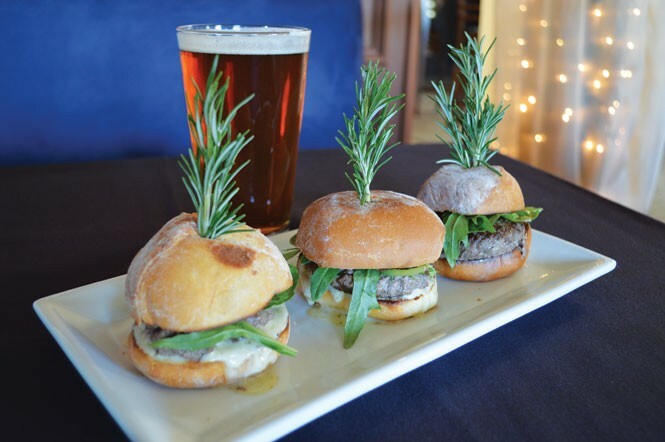 And speaking of burgers, the slider has taken its rightful place among our most iconic bar foods. Even so, you might not expect a venue that specializes in booking world-class live blues acts to think twice about food. But at Bleu Bistro (1615 Foothill Drive, 801-585-8331, BleuBistroSLC.com), owner/chef Carl Weyandt covers the culinary bases with dishes like seared bluefin tuna, chicken saltimbocca, grilled Caribbean shrimp, risotto cakes and my favorite: Wagyu beef sliders with Gorgonzola aioli and organic mixed greens. It was one of the first Utah microbreweries around, so you know that the suds at Roosters (253 25th St., Ogden, 801-627-6171; 748 W. Heritage Park Blvd., Layton, 801-774-9330, RoostersBrewingCo.com) will be great. What you might not know is the greatness of their "What a Crock" appetizer. It's an aptly named crock of eight different cheeses, blended and baked with crab, artichoke hearts, spinach and roasted garlic, served with baguette slices. Sipping a locally brewed beer at Porcupine Pub & Grill (3698 Fort Union Blvd., 801-942-5555, PorcupinePub.com),I'm tempted by classic bar foods like hot wings and nachos. But when I want to class things up a bit, I order the ahi spring rolls. 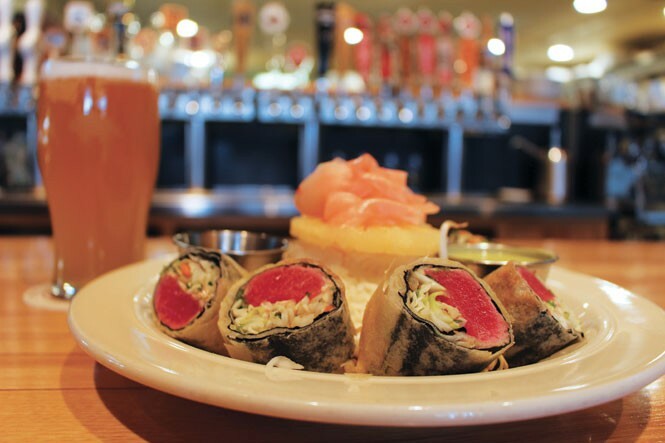 These are nori and rice-paper rolls stuffed with rare sushi-grade ahi tuna, shredded cabbage, mung bean sprouts, basil, cilantro, scallions and crunchy carrots on white rice with pineapple and pickled ginger. It's simply awesome ahi. Coming from owner/chef Ryan Lowder—who brought us The Copper Onion and Copper Kitchen restaurants—it's not a surprise that his classic bar, Copper Common (111 E. 300 South, 801-355-0543, CopperCommon.com), would come equipped with the award-winning fare that his restaurants are known for. The most creative part of the bar menu are the booze & food "flights," where libations such as French Grand Quinquina, Austrian Zirbenz liqueur and Ron Zacapa 23-year-old Solera rum are paired with foods like Stilton blue cheese, nutty Swiss Appenzeller cheese and Italian Guido Gobino Italian hazelnut chocolate, respectively. And, while we're on the subject of wine bars, Meditrina Small Plates & Wine Bar (1394 S. West Temple, 801-485-2055, MeditrinaSLC.com) not only has an eclectic menu filled with items like celery-root ravioli, Korean barbecued porkbelly, butternut-squash agrodolce, and beef carpaccio, but each week there's also Endless Tapas Tuesday, when all-you-can-eat tapas are only $25 per person. Finally, my favorite bar snack might just be at J&G Grill in the St. Regis Deer Valley (2300 Deer Vallley Drive East, Park City, 435-940-5760, JGGrillDeerCrest.com). 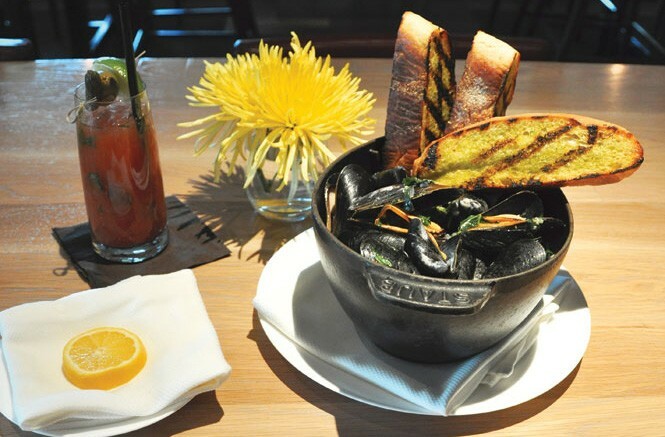 That's where Chef Richard Samaniego executes Jean-Georges Vongerichten's flawless Maine mussels mariniere dish, served in a cast-iron pot with grilled garlic toast for sopping up every last drop of the heavenly mariniere broth.